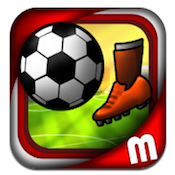 Soccer Puzzle League is an iPhone game developed by Match3Studio. Combining Soccer, Strategy, and RPG elements, Soccer Puzzle League is a strangely addictive little matching game. Featuring great, energetic sound design, paired with anime-style visuals, Soccer Puzzle League provides a great sports atmosphere. However, the busy main menu screen and stats system can be a bit overwhelming at first. There are three different tutorials, which is a very comprehensive way to get comfortable with the game itself. In Soccer Puzzle League, your goal is to match three icons to clear the field (such as a coin, blue glove, or foot.) The controls might be a little different than what most match-3 gamers are used to. Rather than tapping to swap items on the screen, you need to tap the screen, hold your finger down, and then slide it across the three matching items. Additionally, you can match items that are not in a direct row or column, which actually ups the level of difficulty a bit. However, the “tap and hold” method of control slows down gameplay a little bit, and can be a bit frustrating at times. 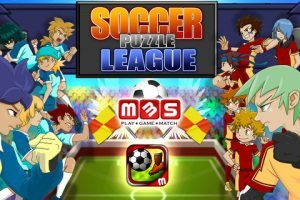 If you like matching games, definitely give Soccer Puzzle League a try! 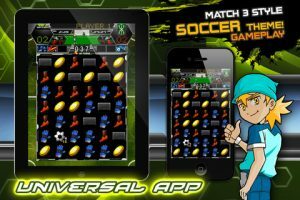 Soccer Puzzle Leagueis compatible with iPhone 3GS, iPhone 4, iPhone 4S, iPhone 5, iPod touch (3rd generation), iPod touch (4th generation), iPod touch (5th generation) and iPad. Requires iOS 4.0 or later.